The African National Congress reportedly will file a motion of no-confidence in South African President Jacob Zuma on Thursday. South Africa's ruling party has given President Jacob Zuma until the end of the day Wednesday to resign. The African National Congress confirmed in a statement Tuesday that it recalled Zuma. The party also will reportedly file a motion of no-confidence in the president Thursday and establish the ANC leader as president as soon as possible. In December, the ANC voted to replace Zuma because of years of corruption allegations, though he's never been convicted. Zuma reportedly said he won't resign until someone from the ANC can tell him what he's done wrong. 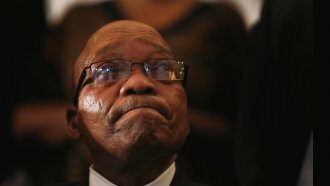 Zuma's second and final presidential term was set to expire next year.